Loganair has been awarded the contract to operate the Orkney inter-isles air service for four years from April 1, securing its future as operator of the world’s shortest scheduled flight following a competitive tendering process. The new contract, awarded by Orkney Islands Council, means the airline will continue to provide Orkney’s inter-isles air services, linking Kirkwall with North Ronaldsay, Sanday, Stronsay, Eday Westray and Papa Westray. The flight between Westray and Papa Westray can be as short as 47 seconds, officially qualifying it as the world’s shortest scheduled flight. The new contract will run for four years, from April 1, 2017 to March 31, 2021, with an additional option for a further 12-month extension period up until March 31, 2022. Loganair’s bid for the Air Services Public Service Obligation Contract (PSO) was assessed against a number of operational and service requirements. These included set-up arrangements, quality of customer service, service frequency, fare structure and service resilience. Loganair inaugurated the Orkney inter-isles air service with Britten-Norman Islander aircraft in September 1967, and has continuously provided these vital links ever since. Events are now being planned to mark the 50thanniversary of the air service and operation of the Islander in Orkney. 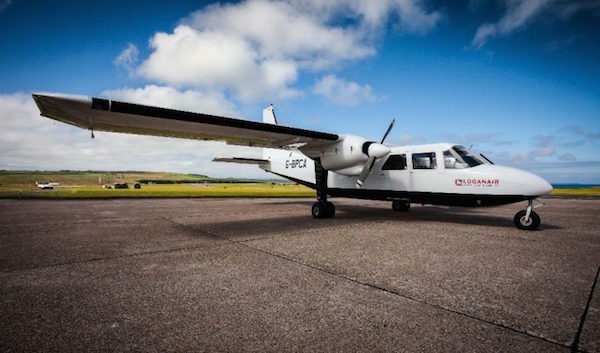 Using Britten-Norman BN-2 Islander aircraft, the service connects the Orkney Islands, transporting teachers and pupils to school, food, mail and banking supplies as well as patients to hospital. Councillor Graham Sinclair, Vice-Chair of Orkney Council’s Development and Infrastructure Committee, said: “The competitive tendering process is important in ensuring value for money. We received three bids to operate these important transport links and, against stiff competition, Loganair was awarded the contract after submitting the most economically advantageous tender. The contract win follows the recent announcement that Loganair will end its franchise agreement with Flybe on August 2017, beginning operations separately from the carrier.